o Unlocked doors can be dangerous. Before you drive away (especially if there are children in the car), be sure that all the doors are securely closed and locked so that the doors cannot be opened from the inside. This helps ensure that the doors will not be opened accidentally. Also, when combined with the proper use of seat belts, locking the doors helps keep occupants from being ejected from the car in case of an accident. o Before opening the door, always look for and avoid oncoming traffic. o The door can be locked or unlocked with a key. 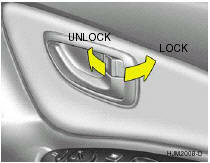 o Lock the door by turning the key toward the front of the vehicle and unlock it by turning the key toward the rear. The driver's door can be unlocked by turning the key once toward the rear. If you wish to unlock all doors, turn the key again toward the rear within 4 seconds. The passenger's side will lock or unlock all doors with just one rotation. 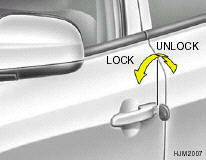 o When pushing the lock switch of the driver's door to the "LOCK" position, only the driver's door can be locked. o When locking the door this way, be careful not to lock the door with the ignition key left in the vehicle. o To reduce the chances of theft, always remove the ignition key, close all windows, and lock all doors and the tail gate when leaving your vehicle unattended. To lock the door from the inside, simply close the door and push the lock switch to the "LOCK" position. 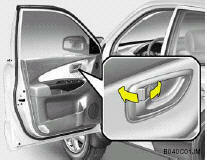 o The driver's door can be opened by pulling the inside door handle even if the lock switch is depressed. The door can be locked without a key. To lock the door, first push the inside lock switch to the "LOCK" position so that the red mark on the switch is not visible, then close the door. 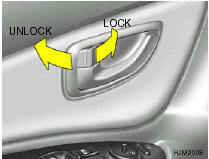 o When pushing the lock switch of the passenger's door to the "LOCK" position, only the passengers door will be locked. To lock the door from the inside, simply close the door and push the lock switch to the "LOCK" position. When this is done, neither the outside nor the passenger's inside door handles can be used. 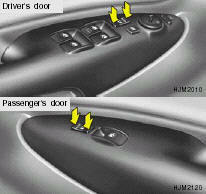 o When pushing the lock switch of the passenger's door to the "LOCK" position, only the passenger's door locks. Your Hyundai is equipped with left and right side "child-protector" rear door locks. When the lock mechanism is engaged, the rear door cannot be opened from the inside. Its use is recommended whenever there are small children in the rear seat. To engage the child-protector feature so that the door cannot be opened from the inside, move the child-protector lever to the " "
To open the door from the outside, pull the outside door handle. The central door locking switch is located on the front door arm rest. It is operated by depressing the door lock switch. o When pushing the front portion of the switch, all vehicle doors will lock. If any door is open when the switch is depressed, the door will remain locked when closed. o When pushing the rear portion of the switch, all vehicle doors will unlock. 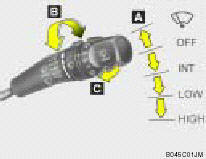 o The central door locking is operated by turning the key in the front door lock toward the front or rear of the vehicle. 2. Push the "LOCK" button on the transmitter. 3. At the same time all doors lock, the turn signal lights will blink once to indicate that the system is armed. 1. Push the "UNLOCK" button on the transmitter. 2. At the same time the driver's door unlocks, the turn signal lights will blink twice to indicate that the system is disarmed. If you wish to unlock all doors, press the "UNLOCK" button on the transmitter again within 4 seconds. - The ignition key is in ignition switch. - You exceed the operating distance limit (393.7 inches [10 m]). - The battery in the transmitter is weak. - Other vehicles or objects may be blocking the signal. - The weather is extremely cold. - The transmitter is close to a radio transmitter such as a radio station or an airport which can interfere with normal operation of the transmitter. Engine Exhaust can be Dangerous!